*Caution: Wear plastic or rubber gloves when handling, cutting and seeding hot peppers or wash hands thoroughly with soap and water before touching your face or eyes. 2. Place mixed pickling spices in a spice bag and tie the ends firmly. Mix all ingredients in a Dutch oven or large saucepot. Bring to a boil, stirring occasionally. Simmer another 20 minutes, until tomatoes are soft. 3. Press mixture through a food mill. Return the liquid to the stockpot, heat to boiling and boil for another 15 minutes. 4. 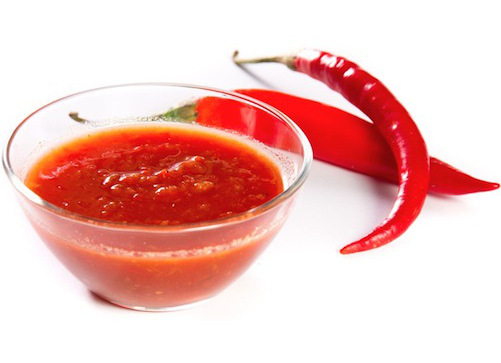 Fill hot sauce into clean, hot half-pint jars, leaving ¼-inch headspace. Remove air bubbles and adjust headspace if needed. Wipe rims of jars with a dampened clean paper towel; apply two-piece metal canning lids.